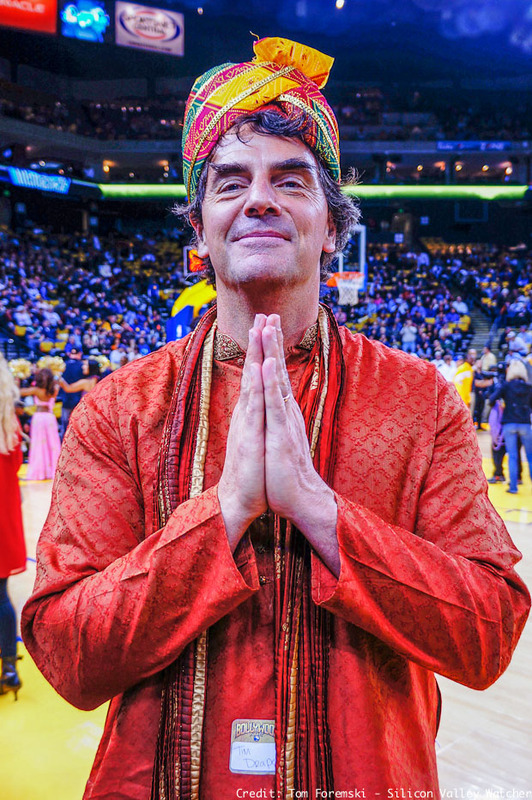 Peter Delevett at the San Jose Mercury News reports that Tim Draper (above at a 2012 Golden State Warriors basketball game) and John Fisher from Draper Fisher Jurvetson, won't be leaving the firm, contradicting a Fortune report. DFJ is one of the first Silicon Valley VC firms. The firm said the co-founders and several others reported to be transitioning out remain managing directors there "and will continue to manage existing portfolio responsibilities." DFJ did confirm that Tim Draper will not help oversee the firm's next fund, though he will personally invest in it... Draper, 55, will spend an increasing amount of time on Draper University of Heroes, the San Mateo school for entrepreneurs that he founded earlier this year. Draper is one of Silicon Valley's more high-profile investors, thanks both to a flair for zany stunts and to his family's roots in the venture industry. His grandfather helped set up one of the first venture capital offices on the West Coast, and dad Bill Draper has financed hundreds of tech companies.